Zhejiang Baochuantransmission Machinery Co., Ltd.
SWC type cross shaft universal coupling used in rolling mill main drive and auxiliary transmission, also suitable for hoisting machinery, mining machinery, engineering machinery, petroleum machinery, vehicle, ship propulsion system, paper making machinery, particularly provides a strong support for the technological transformation of metallurgical industry and machinery products renewal. Seven kinds of type: type BH - standard telescopic welding type universal coupling, BF type - standard telescopic flange type universal coupling, DH type - short scale welding type universal coupling, CH - long telescopic welding type universal coupling, WH - non-stretch welding type universal coupling, WF, telescopic flange type universal coupling, WD type - no scale short form universal coupling. Use to join different organizations in the two axis (driving shaft and driven shaft) to rotate to common transmission torque of mechanical parts. the overloaded power transmission at high speed, some coupling and buffer, vibration and enhance the role of shaft system dynamic performance. Coupling consists of two parts, respectively, and the driving shaft and driven shaft connection. Most general engine by means of coupling machine connected with work. 1.Has a larger Angle compensation ability, SWC type axis Angle of up to 1525, SWP type can reach 10 or so. 2.the structure is compact and reasonable. Adopt and fork SWC type, make the delivery more reliability. 3.the bearing capacity is big. 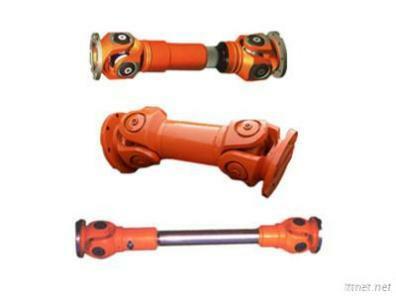 With the rotation of the same diameter, in comparison with other types of coupling the transmission torque is bigger, this the turning diameter restricted mechanical equipment, its supporting range more advantages. 4.the transmission efficiency. the transmission efficiency of up to 98-99.8%, used in high power transmission, energy saving effect is obvious. 5. Delivery is smooth, low noise, convenient installation maintenance. Auto Parts & Transportation, Drive Shaft Assemblies & Differentials, Drive Shaft Assemblies & Differentials/n.e.s.